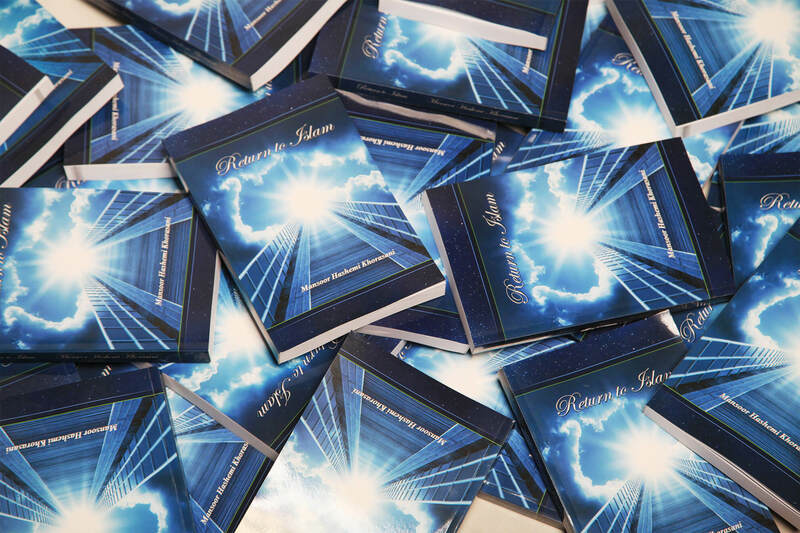 Recently a challenging book with new thinking style in the field of knowledge about Islam with the title “Return to Islam” written by “Mansoor Hashemi Khorasani” has been spread among the Muslim elites and thinkers and it has had various reactions. The content of this book, which has been written in an academic and argumentative manner and with reliance upon Islamic certitudes and certainties of all Muslims from different sects, is criticism of official and common version of Islam and presentation of a distinct and beyond sectarian version with the title “complete and pure Islam”. Author in this book, first explains cognition criterion and considers necessity, unity and self-evidence as three characteristics for it and after plenteous further investigation, considers intellect as its instance and emphasizes that all cognitions inevitably should be concluded with intellect. But he recognizes intellect, different from philosophy and he believes that cognition criterion is the wisdom intellect not the philosophical intellect. In addition he recognizes the millennium long quarrel between Asharites and Adliyah about basis for good and evil or Hosn and Qobh a verbal quarrel originated from recklessness toward creativeness and religiousness of God’s command and prohibition and he believes that intellect and religion are both deeds of God and there is an intrinsic unity among God’s deeds and there is no incongruity or nonconformity among them. After that he explains impediments of cognition and mentions ignorance, imitation, passions, worldliness, prejudice, arrogance and superstition from among its most important instances and thereunder he explains, in a historically and pathologically manner, beliefs and deeds of Muslims and criticizes their intellectual foundations since demise of the prophet peace and salutation be upon him and his household to this day, and then explains and finds the roots for common innovations [Bida’ah] and deviations and miseries and difficulties of the world of Islam. In a part of his book, he recognizes Muslims lack of sufficient and complete knowledge about Islam as the most cause for their division and deviation and he mentions different motives and origins for that; He also knows lack of correct and complete knowledge about one another and about their enemies as another cause for that. One of the important subjects that has been challenged in this book is imitation. He considers imitation from predecessors and oppressor rulers to the meaning of following them, from among the reasons for degeneration of Islamic culture and he deems Muslims uprising against dictator and dependent governments, even though they pretend to be Islamic, permissible; Not only he does not deem imitation from unbelievers to the meaning of following their non-Islamic thoughts and models, a cause for Muslims material and worldly progress, but even he knows it a cause for collapse of their culture and civilization. In addition he recognizes imitation from majority of people, wrongful and then after rejecting validity of consensus and fame as religious reasons due to their conjectural nature, he criticizes democracy theoretically and knows it inefficient, particularly in societies whose people do not have enough intellectual maturity. He also rejects imitation from scholars with the reason that it is just useful for conjecture and conjecture does not have authority in Islam and he knows it one of the causes for divisions of Muslims since long time ago to this day. Yet further he does not even consider Ijtihad to its commonplace meaning which is interpreting laws from conjectural reasoning, correct with regards to invalidity of conjectural reasoning in Islam and he knows it necessary to figure out another solution to achieve certainty. It is clear that, even though this exquisite and distinct view of the author can bring about various political reactions in some countries, they have been mentioned in an intellectual and discursive frame and lacks political orientation. The author then continues by criticizing the theory of “Absolute Wilayah of Faqih” [Absolute authority of jurisprudent] from a foundational point of view and deems it an exaggeration about scholars and considers it invalid from an intellectual perspective; Because the author believes unconditional and unrestricted obedience to someone who may willingly or unwillingly commands opposite to the truth, is against verdict of intellect and religion. Also as a consequence of belief in absolute Wilaya of Faqih [absolute authority of jurisprudent], he believes incontestable obedience to a fallible person and devolving powers of an infallible person to him, habitually becomes a source for various seditions and great corruptions such as political dictatorship, and he knows it as another reason to avoid that belief. It is clear that, even though this critical view of the author has been accompanied by some severe political and security reactions in some of the Shiite countries, it is completely a scholarly view and is similar to the view of their great and famous scholars such as Sheikh Ansari, Akhund Khorasani and Abul Qasim Khou’i, and by no means has a political or anti-security orientation. The author continues by considering superstition, an influential cause that has impacted beliefs and deeds of Muslims and criticizes some of the Sufi people for spreading it and he deems their role, in evading wisdom and a religiousness which is emotional and poetic, bold among Muslims. He also reproaches many poets because of composing beautiful, but incorrect poems which in some cases are in opposition with teachings of the prophets and accounts them like magicians as competitors and enemies of the prophets who obstruct the path of God for people by their “Zukhruf-ul Ghawl” [glittery orations] and “Lahw-ul Hadith” [vain orations]. Another fundamental and important subject that Mansoor Hashemi Khorasani has dealt with in the challenging and outstanding book “Return to Islam”, is Islamic sovereign ruling. In his view, sovereign ruling over people belongs to God only, and no one but Him has the right to have ownership over them and He accomplishes His sovereignty over them through acquiring a representative or the so called “Caliph”. With this description the foundation for formation of Islamic sovereign ruling and its political legitimacy, is contingent upon God’s solid and exclusive permission which does not exist for any of the current rulers in the world of Islam and therefore, none of their sovereign ruling is considered Islamic. He deems the need of appointment from God for an Islamic sovereign ruling one of the most obvious and essential principles of Islam and other Abrahamic religions and he believes that argument and disagreement over it, is meaningless. Indeed the author, contrary to all Muslim scholars from all Islamic sects, deems it possible to access such a ruler and he believes lack of people’s access to such a ruler, contrary to their assumption is not God’s Hikmah [wisdom], rather it is their own failure in providing the necessary conditions for getting access to him and whenever they provide these conditions in a complete normal and common process, access to him will be accomplished for them. Therefore with this description, their lack of access to him is not an excuse for them to choose rulers other than him; Because on one hand, with regards to the fact that there is the possibility to have access to the ruler appointed by God, there remains no necessity to choose another ruler, and on the other hand, their lack of access to this ruler, is due to their own failure and therefore, it cannot be an excuse to choose another ruler, even though apparently it may look like they have no other choice. Therefore Islamic sovereign ruling can only be possible by sovereign ruling of God’s Caliph on Earth and sovereign ruling of God’s Caliph on Earth is only possible by will and determination of people. Khorasani in another place in the book “Return to Islam”, deems it useful and efficient only if Islam is practiced completely and purely and he believes that practicing it partially or alongside something apart from it, not only is not useful and efficient, rather it can be hazardous and harmful and this is contrary to assumption of most of the Muslims who think practicing Islam partially is still favorable and effective. In his view, a unit system with connected parts best exemplifies Islam and if one part in the system does not work, other parts will also lose their functionality and the whole system will stop its functionality too. Therefore, Muslims do not have any choice other than practicing the complete Islam purely and this is a task that can be done under teachings of the God’s Caliph only. Another fundamental and challenging subject in this book is that the author believes performing Islamic punitive measures and punishments is contingent upon implementation of all Islamic, public and political laws and believes these laws have been legislated with consideration of God’s Caliph sovereign ruling on Earth and they are proportionate to time and location in which all Islamic laws are being implemented and act as deterrent factors. Therefore performing these punitive measures and punishments in other times and locations is not just and appropriate; Particularly with regards to the fact that, in the author’s point of view, Islam’s laws are correlated and dependent upon each other and affect one another. It is clear that this viewpoint, even though creates a big challenge in legal sciences and questions basis for implementation of punitive laws, is a complete academic viewpoint and originates from specific intellectual foundations of the author. Mansoor Hashemi in another section of the book “Return to Islam”, knows seven most important impediments for pure and complete implementation of Islam since demise of the prophet peace and salutations be upon him and his family until today as following: Muslim divisions, non-God sovereignty, mixing with non-Islamic nations and cultures, formation of sects and their competition with each other, moral vice and obstructions made by enemies and he talks about every one of them in details from a historic, corrective and beyond sectarian perspective. He also recognizes a Hadith-Oriented mindset as one of the impediments for cognition of pure and complete Islam and its establishment by Muslims; Because in his opinion a Hadith, where it means a conjectural narration from Sunnah of the prophet peace and salutation be upon him and his household, does not have any credibility due to lack of credibility of conjecture in Islam and reasoning based on that in order to derive belief or law is not sufficient. He believes there is no reason to exclude the conjecture coming from Hadith and discriminate it against other conjectures; Because non-credibility of conjecture, is a wisdom law and wisdom laws do not accept exception. Therefore, it is only the Mutawatir Hadith whose narrators are too many and hence causes certainty, is valid and meanwhile such narrations are very few and not too many of them are accessible. Meanwhile, from the authors viewpoint, the solution to this crisis is not to refer to non-Mutawatir narration, rather it is to refer to the Caliph of God on Earth and if referring to him in current time is not possible, it is due to people’s failure in providing the preliminaries for that and therefore there is no excuse for them to refer to non-Mutawatir narration. Hashemi Khorasani believes that people have put themselves in this misery and helpless situation due to their own failure in providing the preliminaries for accessing God’s Caliph on Earth and this helplessness is not caused by God so that contradicts His mercy. Meanwhile, he believes that there is the possibility for them to get out of this helplessness; Because their access to God’s Caliph on Earth is possible whenever they guarantee provision of safety and security for him; Just as his sovereign ruling over them is possible whenever their quest, support and obedience to him is guaranteed by them. Mansoor in another section of the book, knows Islam as submission to God which is accomplished by acknowledging His last prophet and he believes the followers of each prophet before arrival of the next prophet are considered Muslims, and after coming of the next prophet if they acknowledge him, they have remained on their Islam and if they deny him they have become infidels from their Islam. Author in this section of his book, after introducing the last prophet of God and proving his prophet-hood, presents the position of Quran and Sunnah and attracts the attentions toward very important and fundamental remarks in this regard. One of these remarks is the impossibility of abrogation, specification and generalization of Quran by Sunnah of the prophet; With due regards to the fact that dignity of Sunnah is just to represent Quran and cannot have any confrontation with it by no means; even in the cases of Tawatur it is not as Mutawatir as Quran and therefore cannot be positioned alongside Quran. Author, in another section of the book “Return to Islam” recognizes the Sunnah of the prophet peace and salutation be upon him and his household valid and “followable” forever, but he believes that access to it, in a categorical manner, is mostly possible for people of his Excellency’s time and is not possible for future generations. Therefore, posterity needs another source of reference to find certitude in Sunnah of the prophet peace and salutation be upon him and his household and that source of reference is the God’s Caliph on Earth who is the prophet’s representative to implement conformity to laws of God and in principle is always accessible for people just like Quran is. The author after a thorough inspection of categorical Islamic texts, including Quran verses and Mutawatir narrations of the prophet peace and salutation be upon him and his household with an exquisite and convincing method for Muslims public and away from any sectarian orientation, proves that the Caliphs after the prophet peace and salutation be upon him and his household are twelve persons from his household and the first three of them are Ali, Hassan and Hussain and the last one is Mahdi. Then he deals with the position of Mahdi and his role in fulfillment of Islam’s ambition which is global justice and represents some delicacies and accuracies which are ultimately new and unprecedented. For instance, he, contrary to others who know genesis and advent of Mahdi contingent on will and primary action of God and assume it to be a function of His Hikmah [wisdom] and exigency, knows it contingent on will and primary action of people and assumes it is a function of their determination and preparedness and believes with an extraordinary certainty and perspicuity that their access to Mahdi is possible and with this description, they should only think about protecting, supporting and obeying him and should not entertain themselves with protecting, supporting and obeying anyone other than him, regardless in any garb or cover it wants to be. That way, he redefines beliefs and laws of Islam by relying on transparent wisdom requirements and by citing religious categorical texts which are nothing but Quran verses and Mutawatir narrations of the prophet peace and salutation be upon him and his household and presents a new and ultimately distinct version of Islam that can be considered an Islamic ideology and school of thought and creates a revolution in viewpoint and approach of Muslims of the world and becomes the ground preparer of their union and coherence in near future and a grand and fundamental evolution in their political and cultural structures. Therefore, we recommend reading this distinct and effective book to all Muslims of the world, particularly people of knowledge and we expect from officials in Muslim countries that by respecting freedom of thought and expression and practical commitment to Islamic morals, show the necessary patience and broad heart in confrontation with it and avoid irrational and hasty confrontation with genuine contemplation and thoughtful people. ↑. “Ijtihad” is the practice of a “Mujtahid” who makes scholarly and reasoning effort to find religious laws and verdicts.